Usual: "Huh? Mario?! What are you doing in my castle, chump?! Is...is Princess Peach with you?" ~ "GRAAAAAAAAARH! IGNORE THE WORDS I JUST SAID. SUFFER THE TRUE POWER OF BLACK PAINT!" ~ "YOU DARE STEAL THE BLACK PAINT?! LET'S SEE YOU BLOCK...THIS!" ~ "ARGH! THAT'S IT! PREPARE TO FACE...MY LAST BREATH!" ~ "OKAY, NOW THIS IS *REALLY* MY LAST BREATH. THE OTHER ONE WAS JUST A WARM-UP!" Not to be confused with Dark Bowser. Black Bowser (simply referred to in-game as Bowser) is the form Bowser took after he was possessed by black paint in Paper Mario: Color Splash. He serves as the final boss of the game. At Port Prisma on Prism Island, various Toads were enjoying playing with the various colors of paint available. Bowser, who was looking from above, jumped into the rainbow-painted area in the middle of the Big Paint Stars with the intent of giving his shell a rainbow hue. However, his jumping around the paint caused him to inadvertently create black paint, which proceeded to possess Bowser (turning him into Black Bowser) into stealing the Big Paint Stars and ordering his minions to drain the island and its inhabitants of their color. As Black Bowser, he is more malevolent and mean-spirited than normal, willing even to drain Princess Peach's color out of annoyance after he catches her sending Mario messages, as well as making a dark joke after the fact when confronting Mario and mentioning his draining of Peach by saying she claimed she was "framed". In addition, his roar is slightly deeper and more warbled than normal. After Mario and Huey retrieve the first Big Paint Star from Morton and return it to Port Prisma, Black Bowser appears and kidnaps Princess Peach, taking her to his castle on an airship. Following the collection of the remaining Big Paint Stars, Mario and Huey go to Black Bowser's Castle via a kart ride from Luigi. Here, after overcoming some tribulations (including fighting Roy), Mario and Huey confront and eventually defeat Black Bowser, ridding him of the black paint and returning him to his normal self. In the first phase of the battle, Black Bowser's attacks against Mario involve breathing fire, jumping on Mario, and spinning inside his shell at Mario. All of these attacks can be blocked in order to decrease damage sustained with correct timing. As Mario attacks Black Bowser, the black paint will fall from him onto the ground, which can form into Black Lava Bubbles. If Mario fails to defeat them within one attack turn, they return to Black Bowser, restoring some of his HP. 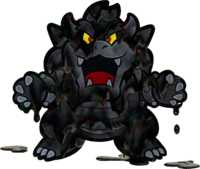 The first phase of the battle is completed when the black paint is completely removed from Bowser's head, temporarily reverting him back to his senses. In the second phase of the battle, the black paint returns to Bowser and increases his size, making him more powerful. When Mario starts attacking Black Bowser, Huey notices that the black paint just comes back to Bowser. As a result, Huey turns himself into a card, allowing Mario to revert him to his 3D form. After this happens, Huey can contain the black paint blocked by Mario. However, he warns Mario that he can only withstand about ten of Bowser's attacks, telling him to make them count. 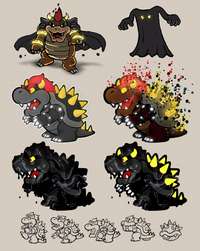 In this phase of the battle, Black Bowser has a few extra attacks. The following attack he uses is determined by the amount of black paint he has pooled around him after Mario's turn. If he has no black paint, Bowser will slowly walk up to Mario and then breathe fire at him, similar to the first phase of the fight, except it deals more damage. If he has a small amount of black paint, he will summon a ball of black paint (about the size of Mario) and throw it at him for 48 damage. If he has a larger amount of black paint, he will turn it into a giant black paint hammer, which he uses to smash Mario for 72 damage. Finally, if he has a large amount of black paint, he will jump into his shell and start spinning in it with the black paint surrounding him as if it became a tornado. He will charge into Mario, dealing 96 damage. When he loses enough HP, he will become enraged and will start to execute his attacks much faster and become slightly more powerful. Now, his black paint ball deals 50 damage, his hammer deals 75 damage, and his shell deals 100 damage. Unlike in the first half, for example, the hammer takes a significant amount of time to charge up, but after suffering enough damage, Black Bowser's hammer swings much earlier than before. When he is almost defeated, he initiates his final, most powerful attack. In so doing, he uses up all his black paint and his own paint to fire a massive black paint ball at Mario. If Mario fails to defend against the attack, he takes 120 damage, which is more than half of his maximum of 200 HP, and the black paint returns to Bowser, restoring almost half of his HP. If Mario successfully defends against the attack and is not knocked out by it, he takes 60 damage (but if Mario has less HP remaining, he will take damage equal to one less than Mario's remaining HP if the attack is blocked) and Bowser is left on his shell, helpless. Mario can then hit him with any attack to end the battle and emerge victorious. On a side note, if Mario lacks any offensive cards while Bowser is helpless on his shell, Huey gives him a Hammer card, claiming that he kept it for such an emergency. Additionally, if Huey absorbs too many of Bowser's attacks, he falls over and is knocked out, along with Mario, causing an instant Game Over. This page was last edited on June 28, 2018, at 09:03.